Unfortunately, during our time researching into Morgan’s situation, the Free Morgan Foundation (FMF) have found that Morgan isn’t the only cetacean (whale, dolphin or porpoise) who has been exploited as a ‘rescued’ animal. For humans, legislation and regulations are sometimes named after a particular individual because they fell victim to tragic circumstances that eventually resulted in a law being created to save others from the same fate. This is also the case for some animals. The Animal Legal Defense Fund has a list of some legislation that is named in honour of animals that suffered at the hands of humans. As such, the FMF has proposed a set of actions that we hope will lead to changes which will protect Morgan and other rescued cetaceans. We term these “Morgan’s Law”. As part of our background research into the fates of rescued cetaceans, FMF have identified 13 facilities (theme parks, aquariums etc) who have laundered cetaceans through so-called ‘rescues’ – so that the animals could be kept for commercial use. In effect, these cetaceans (at least 13 different species, involving many individuals), which needed help, have instead been exploited and have become ‘salvaged assets’ – worth money and often traded and/or used commercially. The FMF therefore hopes that the data presented here, on Morgan’s website, will help not only her but also other cetaceans in similar situations. Rescued cetaceans should be just that – rescued. They should also be treated with the compassion and dignity that they deserve. FMF have conducted due diligence and written a White Paper (a detailed report) that is dedicated as the cornerstone for what we have proposed as “Morgan’s Law”. This highlights the predominantly commercial nature of transactions involving Morgan as a rescued cetacean. Based on the findings from all these investigations the FMF have proposed a number of actions that would improve protection for these animals and which also form part of “Morgan’s Law”. The actions represent long overdue reform at both the national and international level and they will facilitate closing the loopholes exploited by the captivity industry. 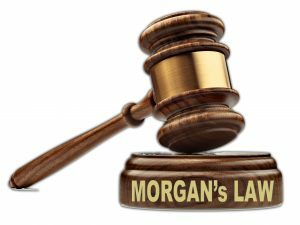 As such, it is our belief that there be a call on the international community to adopt a uniform set of laws and regulations to ensure that nothing like the series of events in Morgan’s case ever happen again. FMF are therefore asking for those in authority to heed that big businesses are not putting the welfare of the animals first and that they, the Authorities, need to step up and confront the situation and afford these animals the rights that they deserve. As part of our efforts to help protect Morgan (and of course other rescued cetaceans) the FMF has a global mandate. We therefore seek to work with international leaders, policy makers and governments to implement these actions. In particular, we wish to influence authorities which are signatories (parties) to CITES (Convention on International Trade in Endangered Species of Wild Fauna and Flora). This is an agreement between countries at the Government level and is supposed to protect species and individuals, such as Morgan. In preparation for the CITES Conference of Parties (CoP17) held in South Africa, September 2016, the FMF focused efforts on the United States Fish and Wildlife Service (FWS) which is the US CITES MA and the European Parliament committee which was working on the EU CITES agenda proposals and which also solicited input from the FMF. As such, we formally submitted four proposed agenda items collectively termed “Morgan’s Law”, which the FMF had hoped to see taken up at CoP17. In the United States, as part of the process for CoP17, the FMF made a public submission to the FWS for consideration on 10 July 2015. This submission remains accessible through the US Federal Registry. On 4 December 2015, the FWS listed the CoP17 agenda-item submissions that had been received by them for further consideration, which included the four submitted by the FMF. In response, on 2 February 2016, the FMF submitted its final comment to the FWS seeking to have the USA submit these items to the CITES Secretariat for inclusion on the agenda at CoP17. This document is also a matter of public record and can be accessed through the US Federal Register. The work of the FMF to protect the rights of cetaceans is recognized by members the European Parliament and the expertise of the FMF board members regarding CITES and EU wildlife trade regulations, pertinent to cetaceans, is also acknowledged outside the Netherlands. On 15 April 2016, European Member of Parliament (MEP) Marco Affronte (Italy), who had been appointed as one of the European Parliament co-sponsors to define Parliament’s position ahead of CITES COP17, contacted the FMF. We, along with other internationally recognised NGO’s, were asked to provide input for agenda items that the European Parliament might want to propose for inclusion for CoP17. The FMF supplied the same four points (i.e., “Morgan’s Law”) that were submitted to the USA for consideration. 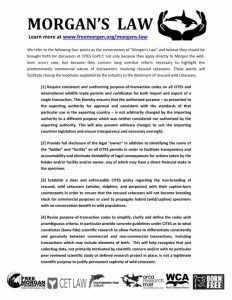 Additionally, six NGO’s (FMF, Cet Law, Dolphinaria-Free Europe, Orca Research Trust, World Cetacean Alliance, Born Free Foundation) prepared an information sheet, listing the four points of “Morgan’s Law”, for distribution at CoP17. These points are listed below but are also available as a PDF for distribution. Please distribute this document to your local government officials and politicians, asking them to assist in promoting the implementation of “Morgan’s Law” so rescued cetaceans are better protected at both the local and international level. 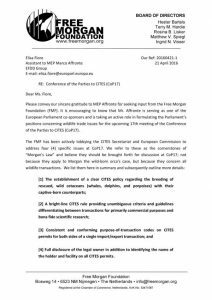 FMF conducted a mail-out for “Morgan’s Law” covering two days (21 and 24 September 2016) during which we distributed the one-page pdf “Morgan’s Law” to individual Party representatives and advisers as well as NGO’s attending CITES CoP17, via email. Individuals from 14 nations (Australia, Canada, France, Germany, Ireland, Italy, Monaco, The Netherlands, New Zealand, Norway, South Africa, Spain, United Kingdom and the United States) plus the European Union, were sent a copy. 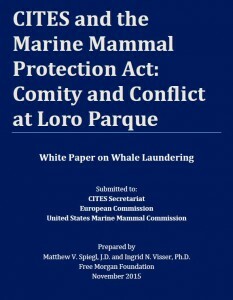 Additionally, the CITES Secretariat and representatives from nine International Organisations & NGO’s (Animal Legal Defense Fund, Animal Welfare Institute, Humane Society International, Lewis & Clark International Environmental Law Project, Natural Resources Defense Council, TRAFFIC (wildlife trade monitoring network), Whale & Dolphin Conservation, Sea Shepherd, and Species Survival Network) were sent a copy. 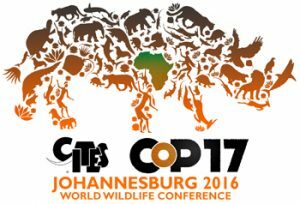 In total, the FMF reached out to 294 individuals in an effort to inform delegates regarding CITES purpose-of-transaction codes in reference to CoP17 provisional agenda item No. 37 and “Morgan’s Law”. Require consistent and conforming purpose-of-transaction codes on all CITES and international wildlife trade permits and certificates for both import and export of a single transaction. This thereby ensures that the authorized purpose – as presented to the exporting authority for approval and consistent with the standards of that particular use in the exporting country – is not arbitrarily changed by the importing authority to a different purpose which was neither considered nor authorized by the exporting authority. This will also prevent arbitrary changes to suit the importing countries legislation and ensure transparency and necessary oversight. Provide full disclosure of the legal “owner” in addition to identifying the name of the “holder” and “facility” on all CITES permits in order to facilitate transparency and accountability and eliminate deniability of legal consequences for actions taken by the holder and/or facility and/or owner, any of which may have a direct financial stake in the specimen. Establish a clear and enforceable CITES policy regarding the non-breeding of rescued, wild cetaceans (whales, dolphins, and porpoises) with their captive-born counterparts in order to ensure that the rescued cetaceans will not become breeding stock for commercial purposes or used to propagate hybrid (wild/captive) specimens with no conservation benefit to wild populations. Revise purpose-of-transaction codes to simplify, clarify and define the codes with unambiguous criteria; in particular provide concrete guidelines under CITES as to what constitutes (bona fide) scientific research to allow Parties to differentiate consistently and genuinely between commercial and non-commercial transactions, including transactions which may include elements of both. This will help recognize that just collecting data, not primarily motivated by scientific concern and/or with no particular peer reviewed scientific study or defined research project in place, is not a legitimate scientific purpose to justify permanent captivity of wild cetaceans.